Enameling is the process of fusing powdered glass material to metal to give it a smooth colored glass coating. 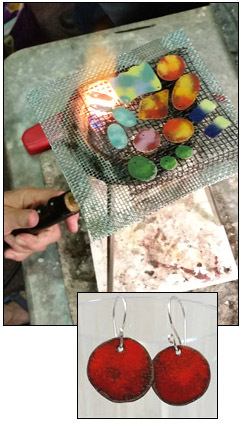 Learn the proper techniques of cutting, filing, cleaning and prepping the metal for the enameling process, then play with the enameling techniques. You’ll leave with several beautiful pieces. This technique of using a propane torch is much more affordable to set up, and has some advantages over working with a kiln.